" I don't want Wings to get hoisted into the Superstar bracket like the Beatles were, T. Rex and Slade can have that... "
Slade may well be the greatest rock band in the world. I didn't say most talented. I didn't say most innovative. I didn't say most avant-garde or chic. I said greatest. And the reason is simple ~ Slade does everything a rock band is supposed to do. Slade conveys what is the basic image and appeal of rock 'n' roll ~ they are loud, flashy, tightly proficient, highly electric, exciting, au courant, vulgar and simple. They interact with their audiences: Slade is the band of the people. They aim for those 12 to 18 year old guys and girls, and they try to make them all 'get up off their backsides' and feel good. They succeed, and that is why Slade is, as Mr McCartney attests, a denizen in 28 karat gold, United Kingdom Superstardom: and that is why Slade continually tops the British record charts and music polls. But unlike with the Stones, T. Rex or Alice Cooper, the superstar presence does not intrude either on or off stage. In fact, sitting around a table at the Union Oyster House, trying to explain to bassist Jimmy Lea what finnan haddie is, or discussing the effect of different brewing locales on Guinnes Stout with lead singer- rhythm guitarist Noddy Holder, or listening to taciturn drummer Don Powell talk (briefly) about English football (rugby), one might well never guess that the addition of then sleeping lead guitarist Dave Hill would create the hottest single piece of rock property that dwells east of Cape Cod. But one would quickly come to the realisation once those four appear on stage, not because of any superstar pose: rather, due to the music and the amazing interplay of band and crowd. 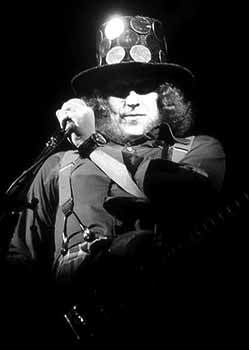 Slade are garbed in the glittery haute couture of rock, yet as soon as Noddy Holder directs his mirrored hat and chalk-on-a-blackboard voice towards the audience, and the group erupts into 'Hear Me Calling" the visuals become decidedly secondary. That is, assuming that the paying customers are typically British, and therefore, responsive. In Boston, such an assumption can not be made. Slade was put on a bill with Steve Miller for two shows at the Orpheum last Thursday night ~ about as diverse a combination as imaginable. Being the opening act (Of the second show only as customs hassles delayed their equipment's arrival too long and forced cancellation of their first set), Slade wound up facing what could politely be called an unsympathetic crowd. Despite a great set of rock 'n' roll, and valiant efforts to get the people moving, the stubborn Steve Miller fans (who would later adore Miller's awful gig) would not budge. Only a handful of Slade-ites were up, dancing and clapping, a pale shadow of the reaction the group had in mind when they wrote the fantastic "Mama Weer All Crazee Now" If that is what it takes to appreciate true rock, then perhaps we should all be more "crazee."